The trial of the former National Security Adviser, Colonel Sambo Dasuki (Rtd) on alleged corruption charges was aborted by the refusal of the Federal Government to produce him in Court for trial. 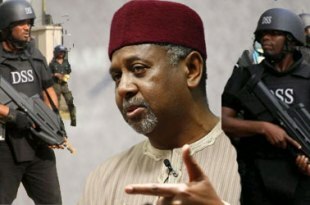 The trial slated before the FCT High Court Abuja could not go on after the judge and Senior Lawyers had waited for over three hours without Dasuki being brought to court as agreed at the last adjourned date. Sambo Dasuki who had been granted bails by four different judges in the last two years has remained in the custody of Department of State Services (DSS) without detention warrant and in disobedient to the court orders on bail. Prosecution counsel, Mr. Rotimi Jacob (SAN) told Justice Baba Yusuf that he was surprised that the former NSA was not within the court premises for the continuation of his trial but however declined to give reasons why the defendant was not produced. He applied that the case be stood down for another one hour to enable him make contact with the agency responsible for Dasuki’s detention. However, counsel to Dasuki, Mr Joseph Daudu SAN informed Justice Baba Yusuf that the statement of Jacob is not helpful to the court and demanded to know the whereabouts of his client. Daudu informed the court that he is apprehensive on the whereabouts of his client who has been in the custody of the DSS since 2015, adding that the only person who can authoritatively informed the court on whereabouts of the Ex-NSA is the prosecution counsel.